2018 Holy Cow! Grand Prize Winner! April 2019 | Holy Cow! Submissions | Winner Robin R.
March 2019 | Holy Cow! Submissions | Winner Kathy K.
February 2019 | Holy Cow! Submissions | Winner Becky W.
January 2019 | Holy Cow! Submissions | Winner Megan L.
Mallory R. | Fulton County Health Center - Outpatient Rehab A patient commented that she really enjoyed working with Mallory. That Mallory was very professional and helpful during her treatment. Great job Mallory. Esther A. | Fulton County Health Center - Outpatient Rehab Esther has worked extremely hard in her short time here. Even though she is being pulled every which way to help cover other facilities she always gives 110% all the time. She is an excellent example for the rest of the team. Her first concern is always for the patient. She is definitely making the rest of us step up our game as she leads by example and always with a smile on her face. Matt L. | Balance and Mobility Therapy Matt is a rehab aide that took initiative and spent the entire afternoon assisting the front desk with scheduling and answering phones. This helped maintain normal clinic operation with so many staff off, allowing therapists to treat patients without disruption. Erin R. | Allied Rehabilitation Services Patients have nothing but great things to say about Erin!! Angi S. | Allied Home Health Services For always lending a helping hand!! Megan L. | Fulton County Health Center - Outpatient Rehab Megan took the time to help me with a task I was unfamiliar with at the outpatient department. I really appreciate her always being willing to help with anything at any time! Kristy G. | Fulton County Health Center - Outpatient Rehab Kristy went above and beyond to help me out on a day that I was a bit overwhelmed. Robin R. | APRN Corporate Robin is making sure all the proper courses/policies are correctly assigned on Medtrainer. This is extremely time consuming with 200+ employees! Thank you for taking one for the team to make sure we’re all in compliance!! Wendy W. | Carter Rehabilitation & Aquatic Center - Adrian Wendy always comes through to help me with my crazy mistakes. She is very patient and will do all she can to help. After looking at numbers all day, you always need a fresh pair of eyes to see where you are wrong. She comes through like a champ each and every time. Thankful for our awesome Billing Manager. Becky D. | Carter Rehabilitation & Aquatic Center - Tecumseh Door knob broke to front bathroom, Becky installed a new one, definitely was a privacy issue and she did it expediently. Lisa A. | Fulton County Health Center - Outpatient Rehab Lisa is always there to give a helping hand. With her many years of being here she is very resourceful. Lisa is very compassionate with her patients and always has a smile on her face! Shelby V. | Fulton County Health Center - Manor | Always going above and beyond to help out! Becky W. | Becky was willing to change her hours without any hesitation to help her coworkers while one was home with sick children. Becky is a great team player always with a positive attitude! Kathy K. | Fulton County Health Center - Outpatient Rehab Kathy worked really hard while a coworker was home with sick children for several days and kept a positive attitude throughout the week! Lisa A. | Fulton County Health Center - Outpatient Rehab Lisa changed her schedule to help a coworker who was at home with sick children without any hesitation. She is a great team player!! Cyndi T. | Allied Home Health Services Her timesheets are organized and accurate, which makes the check off process quick and smooth. Sylvia W. | Carter Rehabilitation & Aquatic Center - Tecumseh She goes above and beyond and makes sure everything is running smooth. She is always doing more than expected. Janet P. | Balance and Mobility Therapy For her help with a huge organizational project. Tammy L. | Balance and Mobility Therapy Willingness to help when needed in many roles and assist with patients; the patients all really enjoy her. Sylvia W. | Carter Rehabilitation & Aquatic Center - Tecumseh She always goes above and beyond. Does a great job at the front desk. CJ M. | Balance and Mobility Therapy CJ helped with a tremendous organizational project! Tammy L. | Balance and Mobility Therapy Tammy helped with a tremendous organizational project! Allison S. | Balance and Mobility Therapy Allison helped with a tremendous organizational project! Steven S. | Balance and Mobility Therapy Steven helped with a tremendous organizational project! Becky M. | Fulton County Health Center - Outpatient Rehab Becky could see I needed assistance with answers to a phone conversation and immediately asked if she could help. She had me transfer the call and resolved the issue in no time. It was greatly appreciated and wasn't the first time she offered her expertise without even being asked. Kathy K. | Fulton County Health Center - Outpatient Rehab Kathy went above and beyond in helping a new patient and his mother. the mother had difficulty in standing for long periods of time and Kathy made several trips out to the waiting area to assist her. She also put cartoons on for the young autistic son. Kim E. | Allied Rehabilitation Services Kim went above and beyond multiple times recently to help with getting the correct assistive device delivered to patients. She communicated with DME companies and the patients to get them the devices they needed. We appreciate her efforts! Bonnie Y. | Fulton County Health Center - Outpatient Rehab Bonnie was very helpful with a difficult situation. She is very willing to be a team player. Lindsay G. | Fulton County Health Center - Outpatient Rehab Lindsay has been extremely helpful during a medical leave for another PT covering multiple areas and assisting with documentation such as helping with a wheelchair denial. Lindsay G. | Fulton County Health Center - Outpatient Rehab Lindsay and Justine organized and presented an inservice on vestibular treatment for their co-workers including a wonderful handout. Becky W. | Fulton County Health Center - Outpatient Rehab Becky always has a positive attitude each and every day she comes to work! She is a pleasure to work with and is a great team player! Gino C. | Carter Rehabilitation & Aquatic Center - Adrian With the large amount of snow that we received Gino on his lunch break made sure that the sidewalk was cleared and salted for our patient's safety. Esther A. | Fulton County Health Center - Manor Esther has been assisting with all settings at FCHC while keeping a very positive attitude. She transitions easily between all settings as well, accepting whatever task she is given. She is a great coworker. Becky M. | Fulton County Health Center - Outpatient Rehab Becky has been great in helping with the front desk office work due to change in staffing. Has been really appreciated!! Jennifer M. | Balance and Mobility Therapy Going above and beyond with patient care, very compassionate with patients in the pool and I am always getting positive feedback from patients who specifically mention her and how helpful she is! Great work Jen! Brian S. | Carter Rehabilitation & Aquatic Center - Adrian Brian is an exemplary employee not just in his help with patients, but also always keeping busy with the behind the scene cleaning that is a never ending and thankless job, and is always pleasant while doing so. Brian S. | Carter Rehabilitation & Aquatic Center - Adrian Brian is ALWAYS doing something. There is a not a moment that he doesn't find something to do. He is very conscious about making sure items and surfaces are cleaned and disinfected which is VERY important especially this time of year. Brian your actions do not go unnoticed. Becky M. | Fulton County Health Center - Outpatient Rehab Becky is a team player and does things for people without even asking. She took the liberty to help a co worker catch up on paperwork by taking a patient back after therapy was done. Angie S. | Allied Home Health Services Always willing to help others no matter how full her plate is. Megan L. | Fulton County Health Center - Outpatient Rehab Megan had to take the lead with discharging all 2018 accounts and creating all new 2019 accounts even though she has never done this tedious detail oriented task before. Great job for getting this done in a timely manner! November 2018 | Holy Cow! Submissions | Winnder Jessica Z.
October 2018 | Holy Cow! Submissions | Winner Paula S.
September 2018 | Holy Cow! Submissions | Winner! Sarrah Z.
August 2018 | Holy Cow! Submissions | Winner! Pat D.
July 2018 | Holy Cow! Submissions | Winner! Catherine C.
June 2018 | Holy Cow! Submissions | Winner! Cyndi T.
May 2018 | Holy Cow! Submissions | Winner! Lisa A.
April 2018 | Holy Cow! Submissions | Winner! Kristy R.
March 2018 | Holy Cow! Submissions | Winner! Keith M.
February 2018 | Holy Cow! Submissions | Winner! Erin S.
January 2018 | Holy Cow! Submissions | Winner! Melissa M.
Lynnette C. | Allied Home Health Services Lynnette does a good job making sure we stay on track with payroll. It is no easy tasks to get a bunch of nurses to get their time sheets in! Robyn H. | Allied Home Health Services Robyn is so helpful with anything we ask of her. She has done a great job with tracking and obtaining signed orders which ultimately keeps our biller HAPPY!! Valencia N. | Allied Home Health Services Valencia has taken on a new role a "Office Coordinator" She keeps all of us on task and organized. She has been very receptive to new job duties and has taken the initiative with implementing new and improved processes. Jen G. | Allied Home Health Services Jen has done a great job with a very high volume of intakes this month as well as keeping all of our nurses organized with the schedule. The authorization process has definitely improved due to her organizational skills. Linda M. | Allied Home Health Services Linda is always willing to lend a helping hand when anyone needs it. She also is a great listener and is always supportive. It is important to have coworkers/friends that care. Amy F. | Allied Home Health Services Amy has done an excellent job transitioning to the OASIS/Admission Nurse. She is very thorough, compassionate, knowledgeable and the patients LOVE her! We are very lucky to have her! Kaylee D. | Carter Rehabilitation & Aquatic Center - Adrian Always willing to go beyond her duties for the company. Brittany O. | Fulton County Health Center - Manor Brittany is a very compassionate person to all her patients and coworkers. She is a joy to work with and always willing to help others out when busy. She is always willing to help others out finding paperwork or answering questions. Debbie W. | Balance and Mobility Therapy Deb has the very difficult task of verification of insurance benefits. Patients do not appreciate the lengths she goes to to verify benefits for their services. It is a complete test of patience to be on hold for long lengths of time, companies that are in foreign countries, different representatives telling her inconsistent information. We appreciate all Deb does!! Leah T. | Balance and Mobility Therapy Leah is a LPTA at BAM. At any time, Leah is helping schedule, answer phones, or handle customer care issues WHENEVER there is a need. She is very responsive when there is a need, any need. Becky W. | Fulton County Health Center - Outpatient Rehab Becky helped a patient fill out paperwork who was struggling with filling it out due to injuring his dominant arm. Toni G. | Carter Rehabilitation & Aquatic Center - Adrian (FMC) Toni does a great job at sacrificing her time for her patients. She tries her best to accommodate patients with tough schedules with their best interest at heart. She also goes above and beyond to ensure that her patients are being well treated during each of their visits while demonstrating patience and concern for each of their needs. Toni is easy going, fun, and a great motivation to those around her. Amanda W. | Carter Rehabilitation & Aquatic Center - Adrian Amanda did a phenomenal job on our annual fundraiser for Fostering Solutions. She is a great team member and goes beyond to make the front desk run smoothly. She is kind to those entering the clinic and is always helpful when therapist need her to make calls, assist in scheduling or finding out more information. Marianne K. | Balance and Mobility Therapy For always putting her employees first and showing appreciation for the work the do to make the business a success. She also puts in extra hours on a weekly basis to ensure the facility is running smoothly. Nan S. | Allied Rehabilitation Services She deals with a lot of information and juggeling things all day long and is always able to give me the answers i need with a pleasant attitude and good humor which i appreciate. Nancy L. | ZMed, LLC Nancy has a "can do" attitude. She has picked up extra responsibility of obtaining the re-supply orders and she has done it with out complaint. She has not requested any additional money to take on an entire job description. She is a gem! We would be lost as a company without her. Anna B. | Carter Rehabilitation & Aquatic Center - Adrian Anna is a true team player! She has been traveling the past month or so to help BAM out on top of her already busy task list she has really taken the time to help them feel more confident and efficient. Tammy L. | Balance and Mobility Therapy For all the valuable health and fitness help for the fitness members. They are OVERJOYED to have her teaching the aquatic classes. Amanda W. | Carter Rehabilitation & Aquatic Center - Adrian Amanda worked very hard on the fundraiser this year. That effort showed in its amazing success! Maren W. | Fulton County Health Center - Manor Maren was willing to help with a transfer when asked due to patient being tired towards end of treatment. She is always helpful when asking questions and showing where paperwork is if needed as well. Joann G. | Fulton County Health Center - ManorJoann noticed a patient had a wheelchair with footrest not working for the patient. She gave the patient a different wheelchair and hunted down for better footrest that was better and comfortable for the patient. Penny S. | Fulton County Health Center - Manor Penny is very helpful at the manor when seeing a patient and encouraging them to work with other therapist. Kayla P. | Balance and Mobility Therapy Kayla has been very helpful in assisting with baking cookies for our patients. Leah S. | Balance and Mobility Therapy Leah has been very helpful in assisting with baking cookies for our patients. Inez C. | Balance and Mobility Therapy Inez has been very helpful in assisting with baking cookies for our patients. Laura W. | Balance and Mobility Therapy Laura has been very helpful in assisting with baking cookies for our patients. Lucia M. | Balance and Mobility Therapy | Lucia has been very helpful in assisting with baking cookies for our patients. Kayla P. | Balance and Mobility Therapy She is always willing to help other staff members out with their schedule when she has a cancellation. She is always keeping herself busy and will help to alleviate the schedule when she can. Crystal S. | Fulton County Health Center - Outpatient Rehab Crystal was extremely helpful making multiple phone calls to a patient's father and other facility departments to get the information he needed to apply for a grant to assist in funding his child's therapy. Megan L. | Fulton County Health Center - Outpatient Rehab After a co-worker left, Megan was put in a difficult position of having to finish training me and begin training another new employee! She did this with much grace and kindness. Not only her knowledge, but her patience and sense of humor were very much appreciated!! Amanda W. | Carter Rehabilitation & Aquatic Center - Adrian She has put all her "spare" time into the our Charity for the Holidays and has never complained about the amount of work. She has taken on the project that Molly normally would be in charge of but, due to her accident has been unable to help this year. ALWAYS has a smile for everyone and is a joy to work with. Grace S. | Carter Rehabilitation & Aquatic Center - Tecumseh For going above and beyond and bleaching the area around the pool. Ariana B. | Carter Rehabilitation & Aquatic Center - Tecumseh For going above and beyond and bleaching the area around the pool. Collette M. | Carter Rehabilitation & Aquatic Center - Tecumseh For taking the extra step to clean around the clinic, especially behind the treadmills. Cassandra P. | Allied Home Health Services Cassandra has been a great addition to our nursing staff. She is always willing to help out when asked and the patients love her. She is willing and wanting to learn new things as they come her way. Amy F. | Allied Home Health Services I would like to nominate Amy for many reasons. She is a great co-worker and easy to work with. She is always willing to help where she can and has taken over her new position of Admissions nurse with ease. She always puts her patients and their needs first. Overall, she is an awesome nurse and we are lucky to have her! Jamie R. | ZMed, LLC She works extremely hard for the company and has stepped up several times for additional responsibilities. Anna H. | Carter Rehabilitation & Aquatic Center - Adrian (FMC) Anna joined our company and quickly became an integral part of our therapy family. She is efficient, friendly, knowledgeable, and a pleasure to work with. Thank you Anna for all you do every day! Amanda W. | Carter Rehabilitation & Aquatic Center - Adrian Every Day, Amanda is helpful, friendly, and efficient at her job. We all know we can count on Amanda when something needs done. She's amazing! Nan S. | Allied Rehabilitation Services Nan is one of the most selfless people in our company. She has a never ending stock of candy and chocolates, she knows every detail of her job and helps anyone who is willing to accept her help. Nan makes us better therapists and a better agency. She is our backbone. Every workplace needs a Nan! Derrick G. | APRN Corporate Derrick is pulled in many directions, all day every day. He is always positive and polite and keeps us up and running, even when we don't even know it. Thanks IT Wizard Derrick!! Toni G. | Carter Rehabilitation & Aquatic Center - Adrian (FMC) Toni travels and does many things for the company and her patients. She is an amazing PT and an even better person. Thank you Toni! Karen L. | Fulton County Health Center - Outpatient Rehab Karen juggles many schedules, projects, and staff and always keeps everyone and everything straight. How does she do it?! Erin W. | Allied Rehabilitation Services Erin invested a lot of time to become a CPR certified trainer for APRN. She trains all our staff, making sure everyone knows how to provide life support to someone in need. Thank you Erin! Tammy M. | Cameron Memorial Community Hospital - Respiratory Since Tammy took over the position of Director of the Respiratory Dept, she has done an awesome job sorting through the mountains of unfinished tasks and keeping the department running. Often when a shift needs covered, she steps in and does the job. She encourages her staff to bring new ideas and solutions for issues that come up. People love working for her because they know she has their backs. This is how a boss should be. Lindsay G. | Fulton County Health Center - Outpatient Rehab Lindsay has been extremely helpful in covering outpatient, Fulton Manor and Hospital evaluations during staff transition and staff illness. Crystal S. | Fulton County Health Center - Outpatient Rehab Crystal had to jump right in at the front desk on her first full week when the regular full time staff called in sick. She did a stupendous job handing the phone, scheduling, new referrals, etc. Sarrah Z. | Fulton County Health Center - Inpatient Rehab Sarrah has been working extra hours and additional days to assist the PT department with evaluations and treatments in the hospital as well as Fulton Manor. Your help is very appreciated!!! Thank you!!! Jenna M. | Carter Rehabilitation & Aquatic Center - Adrian A patient sent a wonderful letter describing the superior care she received by the OT Department, her great recovery that "...advanced farther than I or my surgeon thought possible..." Great Job! Jessica Z. | Carter Rehabilitation & Aquatic Center - Tecumseh A patient sent a wonderful letter describing the superior care she received by the OT Department, her great recovery that "...advanced farther than I or my surgeon thought possible..." Great Job! Justine B. | Fulton County Health Center - Outpatient Rehab A wellness member in the pool was very impressed with the care and compassion Justine gave to her patient. Megan K. | Fulton County Health Center - Outpatient Rehab Megan was very helpful to her coworkers during CPR training. Brittany O. | Fulton County Health Center - Outpatient Rehab Brittany was extremely helpful to her coworkers during CPR training. Shelby V. B. | Fulton County Health Center - Manor Shelby was nice enough to help me problem solve for a patient who was going home but who was unsure they would be able to get into and out of their house safely. CRC - Adrian Staff | Carter Rehabilitation & Aquatic Center - Adrian For helping a co-worker out in the time of need. Todd A. | Allied Rehabilitation Services Patient had nothing but good things to say about Todd upon discharge visit. Patient was hesitant about having therapy and was put on for a very short duration but upon discharge, patient realized the benefits and was very pleased with how things went and how thorough Todd was and explained each exercise and its benefits. Justine B. | Fulton County Health Center - Outpatient Rehab Justine is always willing to help out when ever she is asked. I asked her to step in and treat a patient that was on my schedule since Justine is good with manual therapy and she was more than willing to do this with no questions asked. Aaron D. | Carter Rehabilitation & Aquatic Center - Adrian Aaron is consistently working together with other APRN sites, he is accommodating whenever he can help anyone, anywhere. It often makes his day longer or his job more stressful, but he is always willing to do whatever he can to help our patients and the company succeed! Thank you Aaron! Karen L. | Fulton County Health Center - Outpatient Rehab Karen is thorough, organized, and always so accommodating whenever she can help anyone, anywhere. It often makes her day longer or more stressed, but she is always willing to do whatever she can to help our patients and the company succeed! Thank you Karen! Trish L. | Fulton County Health Center - Outpatient Rehab A new patient's wife complimented Trish on being extremely helpful when they scheduled. Great job Trish. Malikah H. | Allied Rehabilitation Services Malikah flies below the radar when it comes to taking the extra step for her pts, but this time, she nailed it. Upon learning that a pt had forgotten some of his personal items and a custom hand orthotic at a SNF, Malikah contacted the SNF’s rehab dept, tracked down the items, and picked them up to take to the pt. I received a call from the nursing agency saying Malikah is amazing, and that it was a great reflection of ARS’s service. Thank you, Malikah! Erin W. | Allied Rehabilitation Services Erin spent extra time with a family to help them understand the extent of their loved one's dementia. The family needed education and extra care to know that it was time to make some hard decisions. Erin's thoroughness and compassion helped them get to that point. Thank you Erin! Kayla P. | Balance and Mobility Therapy She goes above and behind to help others, specifically to help therapist in gathering objective information to ease completion and improve efficiency with documentation. Kayla is an all around team player! Robin R. | APRN Corporate Robin goes above and beyond normal supervisor duties to ensure that her staff are well taken care of. She shows appreciation for our dedication to the job and lets us know we are appreciated. And just when you think she may have forgotten about you she does something "extra" to let you know she is still thankful for a job well done. Kimberly P. | Balance and Mobility Therapy Kim has been assisting on the gym floor, by answering timers when they go off, when she is able to walk away from the front desk/phone during periods of high patient volume to assist aides when they are all busy. Lynn D. | Balance and Mobility Therapy Lynn is always willing to accommodate her schedule to ensure we have aide coverage when necessary. She even tries to plan vacations around time when there is not a high need to prevent lack of coverage on the gym floor to keep us running more smoothly. Kayla P. | Balance and Mobility Therapy Kayla is always willing to help absorb patients onto her schedule when she has a cancellation as well as come in early for pt's at 7:15 and stay late if necessary to assist with treatments to make more manageable for co-workers. Tammy K. | Balance and Mobility Therapy Tammy stepped out onto the floor as an aide to help assist with treatments when needed. Brittany O. | Fulton County Health Center - Manor Brittany took the initiative to come in extra on the holiday to ensure one of the patients had the required number of visits for the assessment period due to an unplanned discharge and then treated an additional patient who saw her in the building and wanted to be treated that day. Megan L. | Fulton County Health Center - Outpatient Rehab Megan is always extra helpful and always willing to give assistance. She is a great team player. Sarrah Z. | Fulton County Health Center - Inpatient Rehab Sarrah is a very hard worker in the short period of time that she works. She really cares for the patients that she works with. She provides thorough evaluations and well maintains Supervision over the Pt, ensuring the Pt is discharged to the appropriate setting. Valencia N. | Allied Home Health Services Valencia has been willing to take on new roles and has been a great mentor to new employees. Robyn H. | Allied Home Health Services Robyn is always willing to take on more work and offers to help out whenever needed. Linda M. | Allied Home Health Services Linda has tracked down and successfully recouped many outstanding payments. This took a lot of patience and persistence. Jen G. | Allied Home Health Services She has been consistently performing her job as well as seeing patient's daily. She has been able to successfully acquire authorizations and therefore the amounts we are able to bill have greatly improved. Becky M. | Fulton County Health Center - Outpatient Rehab Becky has been helpful with other coworkers seeing a patient for another therapist in need. She is helpful with questions regarding chart review paperwork. Lisa A. | Fulton County Health Center - Outpatient Rehab Lisa goes above and beyond helping staff out taking patients when needed if PT or other coworkers get behind. She is a team player for the clinic. Kim E. | Allied Rehabilitation Services Patient and mother had nothing but good things to say about the care she provided. They were pleased on how thorough she was and the time she took to complete patient's care. Pat D. | Fulton County Health Center - Outpatient Rehab A Physical Therapy patient said her grandson comes for speech therapy and they are very pleased with Pat and the progress he has made. It was a very nice compliment to Pat. Kim E. | Allied Rehabilitation Services Over the past several months, Kim has taken on a couple of pediatric cases for patients that are very medically complex and can require special handling. The home care nurse for one of these children reported she is extremely impressed by the way Kim works with her patient, engaging and interacting with this little boy in such a special way while also providing great care. The nurse said, "It's so fun to see the way he laughs and smiles back at her while she's working with him; he just loves her. I'm so glad she's working with [him]!" Justine B. | Fulton County Health Center - Outpatient Rehab A patient wrote a very nice note about how much she was helped describing (Lindsay) and Justine as the best PT specialists ever! and how they performed miracles to help her. She praised their knowledge and abilities. Lindsay G. | Fulton County Health Center - Outpatient Rehab A patient wrote a very nice note about how much she was helped describing Lindsay ( and Justine) as the best PT specialists ever! and how they performed miracles to help her. She praised their knowledge and abilities. Megan L. | Fulton County Health Center - Outpatient Rehab Megan has been very helpful with all staff assisting them with their needs. She is always very positive and upbeat great team player. Pat D. | Fulton County Health Center - Outpatient Rehab Pat changed her schedule by coming in on her scheduled day off to meet her patient's needs. Trish L. | Fulton County Health Center - Outpatient Rehab Trish followed up with patient accounts when they were going to write off a number of visits to prove to them that we had obtained all of the pre authorizations needed so they could follow up with the insurance company for payment. Jay T. | Carter Rehabilitation & Aquatic Center - Tecumseh Went over and beyond his job duties by putting new seats on picnic table that we have been unable to use for years. Linda M. | Allied Home Health Services Linda has been fighting a battle with Aetna for more than a year to retrieve money due to Allied Home Health. She's winning the battle piece by piece, doing her best to conquer the big fish. Thank you Linda! Lisa A. | Fulton County Health Center - Outpatient Rehab Lisa consistently recognizes when she can be a help to others and does so without being asked. Shelby V. | Fulton County Health Center - Manor Shelby is a very dedicated therapist. She well manages a busy schedule while delivering quality care. This week has been very busy for her but she accepts the challenge while ensuring her coworkers are managing their schedules ok. We are lucky to have Shelby on our team. Lindsay G. | Fulton County Health Center - Outpatient Rehab Lindsay is knowledgeable and helpful when asked about manual techniques. She also is always willing to answer questions regarding patient care. Lisa A. | Fulton County Health Center - Outpatient Rehab Lisa is very helpful and a team player. Always willing to help when another co-worker needs help with putting up equipment. She is a personable and approachable person with questions if needed. Catherine C. | Fulton County Health Center - Manor Catherine assisted the Tecumseh outpatient facility due to one of their COTA's being off sick. Becky D. | Carter Rehabilitation & Aquatic Center - Tecumseh She is an amazing trainer. She is a great leader and always willing to help. Erin R. | Allied Rehabilitation Serviecs For going the extra mile to get things done. Brian S. | Carter Rehabilitation & Aquatic Center - Adrian Brian helped move heavy bankers boxes in the billing office today. Brian is a hard worker and always willing to help where he is needed. He is one of the few techs who constantly working. Even in the down times, you will always find Brian working hard! Brian is a great asset to Carter!!! Molly S. | Carter Rehabilitation & Aquatic Center - Adrian Molly helped out in the billing office packing things in bankers boxes today. It was tremendously helpful and appreciated. Molly is always willing to lend a hand wherever she is needed. She is truly one of Carter's best Employees. Her hard work does not go unnoticed. Angi S. | Allied Home Health Services She took on a ton of extra work while I was on vacation. She has also been working very hard while we have been short a few nurses. She has her own duties to perform, but is always willing to help others out when needed. Kim E. | Allied Rehabilitation Services Thanks for being a team player when it came to covering visits for a vacation over this past busy week. Keith M. | Allied Rehabilitation Services Thanks for being a team player when it came to covering visits on a busy week covering for a vacation. Angi S. | Allied Home Health Services Staff have turned to Angi as a leader at AHS. She has extensive clinical knowledge and the ability to make decisions quickly, helping the team stay confident and collected. Thank you Angi for going above and beyond to keep the Agency running smoothly, whether it is chart audits, answering the phones/texts, talking with patients, physicians, insurance companies, other staff or going in the field to see patients, you always do what needs to be done, putting your own needs on a shelf. Your selflessness does not go unnoticed. Jamesha L. | Allied Home Health Services Jamesha has been amazing as a new nurse in the home care venue. She has learned quickly, applied her skills effectively, and taken on a caseload that a seasoned veteran would struggle to coordinate. Thank you for all you do, we are excited to have you on our team! Cyndi T | Allied Home Health Services Cyndi has taken on additional work to help with covering vacations and a medical leave. She is always willing to work over the weekends and pick up extra work when we need her. We are lucky to have Cyndi on our team!! Robyn H. | Allied Home Health Services Robyn has voluntarily taken on more work assignments, is eager to learn and contribute more every day. She has a great attitude and is amazing help, we are lucky to have her. Linda M. | Allied Home Health Services Linda has stepped up her efforts at keeping everyone on track with internal operations at AHS. Linda has taken on a leadership attitude and keeping us grounded. Thank you! Jen G | Allied Home Health Services Jen has volunteered to work extra, has taken additional on-call to help us out at a time when we need her most. She is doing an exceptional job at getting insurance authorizations for our clients. Way to go Jen, thank you! Valencia N. | Allied Home Health Services Valencia has stepped up to take on more responsibility at a time when we need her the most. She has been reliable and helpful with taking on more work and also helping to train new staff. She's a Rock Star! Justine B. | Fulton County Health Center - Outpatient Rehab A Patient came in to get some paper work. I had to take her up to the department she needed. I asked Justine if she could listen for the phones while I was out of the department. She did a wonderful job, for the phone did ring. Thanks Justine. Kim E. | Allied Rehabilitation Services Recent Allied patient stated that he specifically requested the same therapist and agency for home care as he had prior. He stated that Kim is excellent and he would refer the agency to anyone he knows that needs home care and plans to recommend it to those he sees at the senior center. Aubrey M. | Carter Rehabilitation & Aquatic Center - Adrian Aubrey was able to handle things at the front desk for a little bit until one of the other front desk workers could get in. She didn't hesitate to just take control! Thanks for the helping hand. Brian S. | Carter Rehabilitation & Aquatic Center - Adrian Brian consistently goes above and beyond to help anyone that asks, and looks for things to do to help out in his spare moments. He will do anything that he is asked to do with a smile on his face, and a cheerful, positive attitude. Catherine C. | Allied Rehabilitation Services Catherine has been such a wonderful support for the OT dept at ARS. When staffing changes at the end of March caused some responsibilities to be redistributed to me as the primary OT, Catherine really stepped up to help lessen the load. She even chose to see patients over the weekend knowing it would reduce the stress for a very busy upcoming week!! Todd A. | Allied Rehabilitation Services During an extremely busy week, Todd drove way outside of his normal service area to cover a daily therapy patient when other staff members were either already scheduled or out on PTO. Thank you for always being willing to help our patients and coworkers, Todd! Lana W. | Allied Rehabilitation Services Pt voiced they were very pleased and enjoyed their treatment with Lana. Joe S. | Balance and Mobility Therapy Joe shortened his lunch to treat a patient early who was being seen by 2 different disciplines and did not schedule transportation correctly to modify for lunch hour. Kim H. | APRN Corporate I couldn't figure out why my time card was wrong and Kim was very friendly & able to figure it out and correct it for me. Tracy Y. | Fulton County Health Center - Outpatient Rehab Tracy has been helping with the pediatric caseload at FCHC and has done a phenomenal job with the kids and being creative to achieve their goals. She is doing a wonderful job. Molly S. | Carter Rehabilitation & Aquatic Center - Adrian Molly kept the organization in the OT department while the normal OT was on vacation, despite multiple clinicians working in the office with many patients. Susie T. | Fulton County Health Center - Outpatient Rehab Helped sort out computer glitches to assist with printing paperwork for assessments. Lisa A. | Fulton County Health Center - Outpatient Rehab She has been very helpful with question asked for my transition working at fulton county. Kira R. | Carter Rehabilitation & Aquatic Center - Adrian Kira covered multiple shifts for Occupational Therapy when the OTR was on vacation, making it so others did not have to over-stress to find coverage. Laura W. | Carter Rehabilitation & Aquatic Center - Adrian Laura took on extra responsibility to cover OT evaluations at Carter Rehab-Adrian while the normal OTR was on vacation. Lisa A. | Fulton County Health Center - Outpatient Rehab OTR had squeezed a splint pt in for a re-adjustment and repair. A mandatory meeting was scheduled for that afternoon. Lisa did not have a pt and was kind enough to assist OTR with the splint to ensure it would be done in time for OTR to make the meeting. Megan L. | Fulton County Health Center - Outpatient Rehab Megan was very patient and helpful in assisting in the fabrication of a custom fit dynamic splint. She put her other duties aside to assist for approx. 1 1/2 hours on this complicated splint. She then assisted in the cleaning up and putting away of items so therapist could see her next pt. Thanks a ton. Sam S. | Fulton County Health Center - Outpatient Rehab Sam volunteered his time for the annual sports physicals for Wauseon High School to raise money for their scholarship fund. Matt T. | Fulton County Health Center - Outpatient Rehab Matt volunteered his time for the annual sports physicals for Wauseon High School to raise money for their scholarship fund. Lisa A. | Fulton County Health Center - Outpatient Rehab Lisa volunteered her time for the annual sports physicals for Wauseon High School to raise money for their scholarship fund. Josh V. | Carter Rehabilitation & Aquatic Center - Adrian When preparing for my Parkinson support group meeting, I had difficulties with the AV equipment. Josh rescued me and even brought his personal speaker from home so that my aging group would be able to hear the video presentation. He repeatedly checked in on the group to make sure all was good! Josh has also been a catalysis in promoting fitness among the CRCS staff and is always willing to help with individual plans. Lynn D. | Balance and Mobility Therapy Lynn is always stepping up to the plate to adjust her hours for maintaining coverage with aides as we have lots of part-time aides that can't always assist with vacation coverage. Jessica Z. | Carter Rehabilitation & Aquatic Center - Tecumseh Jessica took on a lot of extra stress and responsibility to help accommodate a vacation. Penny S. | Carter Rehabilitation & Aquatic Center - Tecumseh During a medical emergency Penny stayed focused, gave direction, stayed calm and truly cared about the person in need. She did this while also going about her full schedule. Amanda W. | Carter Rehabilitation & Aquatic Center - Adrian Amanda has been instrumental in helping staff get their Medtrainer assignments completed, making sure our company is compliant with all regulations. Thank you so much for your contributions to the company!! Becky D. | Carter Rehabilitation & Aquatic Center - Tecumseh Becky has been instrumental in helping staff get their Medtrainer assignments completed, making sure our company is compliant with all regulations. Thank you so much for your contributions to the company!! Angi S. | Allied Home Health Services Angi has been instrumental in helping staff get their Medtrainer assignments completed, making sure our company is compliant with all regulations. Thank you so much for your contributions to the company!! Tanya T. | Allied Home Health Services Tanya has been instrumental in helping staff get their Medtrainer assignments completed, making sure our company is compliant with all regulations. Thank you so much for your contributions to the company!! Nan S. | Allied Rehabilitation Services Nan has been instrumental in helping staff get their Medtrainer assignments completed, making sure our company is compliant with all regulations. Thank you so much for your contributions to the company!! Erin W. | Allied Rehabilitation Services Erin has been instrumental in helping staff get their Medtrainer assignments completed, making sure our company is compliant with all regulations. Thank you so much for your contributions to the company!! Karen L. | Fulton County Health Center - Outpatient Rehab Karen has been instrumental in helping staff get their Medtrainer assignments completed, making sure our company is compliant with all regulations. Thank you so much for your contributions to the company!! Kristy R. | Fulton County Health Center - Respiratory Kristy has been instrumental in helping staff get their Medtrainer assignments completed, making sure our company is compliant with all regulations. Thank you so much for your contributions to the company!! Nicole M. | Cameron Memorial Community Hospital - Respiratory Nicole helped the company stay compliant, making sure everyone completed their Medtrainer assignments. We are so thankful for your contributions to the company!! Lindsay G. | Fulton County Health Center - Outpatient Rehab Lindsay has been wonderful in trying to maintain our caseload and meet all requirements for co-signs, reicertifications, etc. Becky M. | Fulton County Health Center - Outpatient Rehab Becky is always willing to help answer phones and schedule patients when front desk staff are busy!! Tracy Y. | Fulton County Health Center - Manor Tracy created a wonderful bulletin board in celebration of OT Month to put in the hallway by the therapy room. Britney O. | Fulton County Health Center - Manor Britney is very diligent in obtaining objective measurements with nearly every patient she treats. This is true not only at Fulton Manor but also when she comes over to help us at outpatient. We could all strive to be more consistent with this and Britney is a great example to follow. Tammy L. | Carter Rehabilitation & Aquatic Center - Adrian Tammy did such a great job helping out with setting up the hallway and dark room to use for our balance patients. She is always one to go above and beyond to help you out around the clinic when needed. Amanda W. | Carter Rehabilitation & Aquatic Center - Adrian She had went above and beyond trying to get a patients treatment approved for more visits. She must of called several contacts before she got an answer for the patient. Tracy Y. | Fulton County Health Center - Manor Tracy put together the most awesome bulletin board display to celebrate OT month! Thank you, Tracy! Joanne G. | Fulton County Health Center - Inpatient Rehab Being such a hard worker and filling in all of the holes at the office! Megan L. | Fulton County Health Center - Outpatient Rehab Being so willing to help out at the Manor when we were behind! Steve S. | Allied Home Health Services Steve was spoken of very highly by a rep from Coram. She said he represents Allied Home Health with integrity and gives Allied a great name in the community! Way to go Steve!! Derrick G. | APRN Corporate Derrick recently updated the website for the Corporation along with all of the company's websites. It looks amazing. It's attractive and easy to read/navigate. Thank you for the wonderful care you provide to make our company shine! Erin R. | Allied Home Health Services A difficult patient was very happy with Erin's treatment during a reassessment. Penny S. | Fulton County Health Center - Manor I asked Penny for some assistance with my patient while she was busy doing her own paperwork. She quickly and happily helped me and went further out of her way helping me get the resident back to their room. Keith M. | Allied Rehabilitation Services Keith has willingly covered needed hours in Fulton County for 2 weeks in a row while also balancing home health visits across his service area. Malikah H. | Allied Rehabilitation Services We received an OT referral for a patient who, according to the nursing agency, was notorious for being non-compliant which resulted in frequent hospitalizations. However, due to the care and service that Malikah has provided, this patient has not only participated in every planned therapy visit, but is requesting additional visits to contiune progressing toward increased function, safety, and overall well-being. The nursing agency has been very impressed by and grateful for the progress this patient is making with Malikah! Amanda W. | Carter Rehabilitation & Aquatic Center - Adrian No matter how busy she is, Amanda can be relied upon to get things done. She does so with a smile. We so much appreciate her work ethic and efficiency with helping Carter take care of our patients! Thank you! Lisa A. | Fulton County Health Center - Outpatient Rehab Lisa was more than willing to change her schedule to accommodate for patients during a week when needed. Trish L. | Fulton County Health Center - Outpatient Rehab Trish stayed after the end of her shift, to help locate a misplaced chart that was needed at the hospital the following day. She stayed until it was found, even though she needed to get home for her daughter's birthday. Lucia M. | Balance and Mobility Therapy A patient came to check in for an appointment and told her that she is just a bright ray of sunshine in his day. He was so sweet and sincere. Becky D. | Carter Rehabilitaiton & Aquatic Center - Tecumseh Takes initiative in assisting with various clinical tasks/problem solving to make sure clinic runs smooth and therapists focus can be on patient care. Becky M. | Fulton County Health Center - Outpatient Rehab Becky readily jumped in without being asked to perform another co-worker's duties when her co-worker was off for an extended time. FCHC Respiratory Staff | Fulton County Health Center - Respiratory We are a 24 hour 7 day a week department. Many months are very busy for us. This year has been extremely busy. The department personnel has worked many hours outside of their normal schedule and moved their schedules around to cover the increased work load. This staff is knowledgeable, cohesive, and extremely efficient to complete all therapy on time as ordered. Patients as well as hospital staff including physicians regularly praise this department. This department never asks for praise and continually works to improve the reputation of APRN and the hospital. The normal day to day activities, even when extremely busy, should be a Holy Cow. This group of individules are always going above and beyond for APRN and Fulton County Health Center. Lisa A. Fulton County Health Center - Outpatient Rehab During a recent snowy day, Lisa went back and forth multiple times between outpatient and Fulton Manor to assist co-workers with coverage in both locations. Brad G. | Fulton County Health Center - Outpatient Rehab Brad was very flexible and attempted to assist his co-workers cover all treatments and evals in the outpatient, inpatient and Fulton Manor when several workers were unable to make it to work due to snow. Thanks Brad! Lindsay G. | Fulton County Health Center - Outpatient Rehab Lindsa made it from Toledo to Wauseon on a very snowy day when several others were off. She completed assessments and treatments in the hospital, Fulton Manor, Outpatient clinic and the outpatient pool. She was additionally asked to see a home health client for treatment so an additional PTA did not need to drive out this way. It was an extremely busy day for her, yet she was able to keep great perspective. Great job! Lisa A. | Fulton County Health Center - Outpatient Rehab Lisa went out of her way to assist me with a challenging patient when an unexpected personal issue arose. I greatly appreciate the help as it would have taken me much longer on my own, increasing patient's from treatment. Anna B. | Carter Rehabilitation & Aquatic Center - Adrian Anna volunteered to help re-verify insurances for the new year which filling out benefit sheets and updating the information on te patient accounts in the computer. This helped out the billing department tremendously!! Thank you, Anna!! Amanda W. | Carter Rehabilitation & Aquatic Center - Adrian Amanda volunteered to help re-verify insurances for the new year which includes filling out new benefit sheets for the patient and updating the information on the patient accounts in the computer. This helped out the billing department tremendously!! Thank you, Amanda!! Kayla P. | Balance and Mobility Therapy Kayla is always willing to help those with treatment notes when she has opeings on her schedule. She will jump into the pool area and assist with documentation as well as help PT with taking one of their Pt's when she can so they can get other documentation completed. She is always looking for projects to keep her busy and her dedication to the job is GREATLY APPRECIATED!! Raymond G. | Fulton County Health Center - Respiratory Raymod cleaned a patient's home BiPAP machine that was brought from the patient's home to be used for a study. Raymod meticulously cleaned all the parts of the machine, mask, and tubing. And taught the patient how to properly clean and maintain their BiPAP machine. Raymond had a very positive attitude and the machine, and parts looked like new after he finished cleaning it. Erin R. | Allied Home Health Services For helping out with picking up visits when PTA's were busy. BAM Staff | Balance and Mobility Therapy We had a gas leak one day and a real icy parking lot another day and BAM employees went above and beyond to ensure the safety of patients. April J. | Fulton County Health Center - Outpatient Rehab During documentation review Apirl was 100% with obtaining objective measurements. Great job April! Debra S. | Carter Rehabilitation & Aquatic Center - Adrian Deb has recently picked up a few extra days to help fill in for a couple co-workers that were out on medical leave. Don W. | Carter Rehabilitation & Aquatic Center - Adrian With the weather being gross today we were short staffed and kept a smile on his face and went along with the hustle of trying to place patient's. Zane D. | Carter Rehabilitation & Aquatic Center - Adrian He is our on site fix it man for simple handy man needs! Brian S. | Carter Rehabilitation & Aquatic Center - Adrian With the weather being gross today we were short staffed and he kept a smile on his face and went with the hustle of trying to place patient's. Zane D. | Carter Rehabilitation & Aquatic Center - Adrian With the weather being gross today we were short staffed and he kept a smile on his face and didn't complain about the hustle while trying to find where we were putting patient's. Zach P. | Carter Rehabilitation & Aquatic Center - Adrian With the weather being gross today, we were short staffed and he kept a smile on his face the whole time while figuring out where we were placing patients. Not once complaining. Dianna O. | Carter Rehabilitation & Aquatic Center - Adrian Dianna cheerfully took on extra patients when we were short staffed. Andrea B. | Carter Rehabilitation & Aquatic Center - Adrian Andrea happily covered extra patients when needed. Amanda R. | Carter Rehabilitation & Aquatic Center - Adrian Amanda cheerfully pitched in to cover patients when we were short-staffed without complaint. Trish L. | Fulton County Health Center - Outpatient Rehab Trish has taken great initiaive to learn a new EMR and set up process, etc. to transition from FCHC aquatics to APRN aquatics. April J. | Fulton County Health Center - Manor Our PT was off sick and April was the only treating PTA on staff that day. She had all of the patient's on her caseload, plus an insurance update. She took it all in stride and had no trouble getting everyone seen for PT. Great job, April and thank you for your hard work!! Shelby V. | Fulton County Health Center - Manor We were understaffed during a holiday weekend when Shelby offered to come and treat Pt's with me so I could get out early for New Years Eve. She has been in the ER with a family member that night until midnight and had no sleep but still showed up to work to help me the next day. Wow!!!! What dedication. She is a wonderful OTR and the best co-worker ever. Thanks so much Shelby. It was well appreciated. Dana S. | Balance and Mobility Therapy For an above and beyond clean up duty!! Lindsay G. | Fulton County Health Center - Outpatient Rehab Lindsay willingly went over to the pool at the last minute in the sub zero temperatures so we would be compliant with our 10th visit rule. Lynn D. | Balance and Mobility Therapy Lynn helped me at the front desk today covering my lunch for a half hour when we were short staffed. She also helped cover pulling charts. I was really thankful she was there to be a back up. Debbie W. | Balance and Mobility Therapy Deb jumped in and answered phones and helped with patients appts today when we were short staffed. She has not been trained to do this but from watching up knows the steps to do so. I am so appreciative for this. Dan S. | Balance and Mobility Therapy For the technical advice when in a crunch! Melissa M. | Balance and Mobility Therapy Melissa coordinated and assisted the St. Pats Bear Den for a community service project to clean the litter in the woods and surrounding BAM building. It looks so much nicer and it was well above and beyond!! December 2017 | Holy Cow! Submissions | Winner! Joe S.
November 2017 | Holy Cow! Submissions | Winner! Gino C.
October 2017 | Holy Cow! Submissions | Winner! Tammy T.
September 2017 | Holy Cow! Submissions | Winner! Nina A.
August 2017 | Holy Cow! Submissions | Winner! Zach P.
July 2017 | Holy Cow! Submissions | Winner! Cherie' L.
June 2017 | Holy Cow! Submissions | Winner! Ashley G.
May 2017 | Holy Cow! Submissions | Winner! Megan L.
April 2017 | Holy Cow! Submissions | Winner! Joe S.
March 2017 | Holy Cow! Submissions | Winner! Kim E.
February 2017 | Holy Cow! Submissions | Winner! Luchia M.
January 2017 | Holy Cow! Submissions | Winner! Jessye H.
Greg L. | Allied Rehabilitation Services Greg has stepped up and taken on additional reponsibilities with the staffing changes that have impacted our office over the past several months. He has offered to help out with several projects to improve our process and maximize business in order to share the load. Greg has done a great job balancing his wide array of job tasks and helping other staff out in a pinch, all with a great sense of humor! Nan S. | Allied Rehabilitation Services There isn't a day that goes by when Nan doesn't go above and beyond!! Agencies repeatedly comment on how she's so helpful, always willing to answer questions and explain (and re-explain) processes, and is always pleasant and professional. Nan is always willing to help out with a project, make last minute phone calls, or gather materials at the drop of a hat. She's the fist smiling face we all see at the beginning of the day, and she has a way of making each employee feel special. Nan is the glue that holds our office together - we don't know what we'd do without her!! Trish L. | Fulton County Health Center - Outpatient Rehab Trish was scheduled to have the morning off and came in and opened for a coworker who had a sick child without hesitation! Trish is a great team member and a pleasure to work with. Penny S. | Carter Rehabilitation & Aquatic Center - Tecumseh Penny is always willing to help regardless of how busy she is. Penny goes above and beyond to help keep the clinic running smoothly. Erin R. | Allied Home Health Services Erin did a great job of warming up a very difficult Pt; the Pt loved Erin and said she couldn't believe how "thorough" she was during the eval. Dan S. | Balance and Mobility Therapy A wonderful compliment from a patient, "I want to see you every time, I feel like you help me the most". Karen L. | Fulton County Health Center - Outpatient Rehab Karen is a great leader, leading by example, working hard for everyone's benefit. She had a lot to deal with this whole year and she is so organized and helpful in every situation. Thank you! Derrick G. | APRN Corporate Derrick is the quiet, dependable guy who gets everything done, many many things which are not remotely related to IT situations. He never complains, he always delivers on time, and is usually fixing things before we even knew they were broken. Derrick is a true asset to APRN! Tracy Y. | Fulton County Health Center - Manor Tracy is a Rookie of the Year. She has only been with us a short time but gets compliments everywhere she goes, from patients and coworkers alike. She has been a great addition to our company! Karen S. | Fulton County Health Center - Outpatient Rehab Karen took a position in the company at a different site, which was a difficult decision, but she is humble and kind, always thinking of others first. She is a great asset to the company!!! Aubrey M. | Carter Rehabilitation & Aquatic Center - Adrian Thank you Aubrey for taking the time to show corporate how to improve the therapist documentation station. You put a lot of time into your suggestions, thinking of ways to help ALL the therapists. You are an asset to the company! Paula S. | Carter Rehabilitation & Aquatic Center - Adrian Thank you Paula for offering corporate ways to improve the prep area in the clinic. You thought of all the staff, not just yourself, in how to make it easier, more ergonomically correct, and efficient for better patient care. You are an asset to the company! Erin R. | Allied Rehabilitation Services Erin works very hard with little or no recognition for being a superior PT.She makes sure all the PTA's have solid POC's and work to do. She is a great asset to our company! Laura W. | Carter Rehabilitation & Aquatic Center - Tecumseh Thank you Laura for moving your vacation to another week to allow a co-worker to take a vacation. That was very generous and thoughtful, always putting others first. You are an asset to the company! Sarah M. | Carter Rehabilitation & Aquatic Center - Tecumseh Thank you Sarah for representing all us PTA's at the Apollo meeting. You helped give us a voice by providing organized and thoughful information at a very important meeting. Lindsay G. | Fulton County Health Center - Outpatient Rehab Lindsay goes wherever she is needed and does so with a smile and offers great patient care wherever she goes! Christine K. | Allied Rehabilitation Services Christine provides so many different types of services to her patients in so many different settings. She is a humble, talented and diverse clinician who provides superior patient care with very little recognition. What an asset she is to our company! Toni G. | Carter Rehabilitation & Aquatic Center - Adrian Toni does whatever is asked of her, she does it well, and does it with a smile! She is a true asset to our company! Holly C. | Carter Rehabilitation & Aquatic Center - Adrian Holly has worked very hard to help organize a new clinic and learn all new systems, processes, coworkers, and patients. She is great worker doing a great job! Nina A. | Carter Rehabilitation & Aquatic Center - Tecumseh For always working with a smile, no matter the situation, willing and capable of helping in all situations. Erin W. | Allied Rehabilitation Services Erin is a hard worker, she balances administrative duties and patient care without complaint. She takes great care of her patients and the COTA's who work directly under her supervision. Thank you Erin! Catherine C. | Fulton County Health Center - Manor Catherine goes wherever she is asked to go, does whatever she is asked to do. She does so with a smile on her face and never complains. She is a great asset to APRN. Brian S. | Carter Rehabilitation & Aquatic Center - Adrian Brian continuously finds work to do when there are no patients to work with; whether he is learning new techniques, cleaning machines, or finding ways to help the therapists, Brian is exceptionally hard working. It is always a pleasure to work with Brian. John W. | Balance and Mobility Therapy John works at a hustle and determination all day long! No matter what the task. Lucia M. | Balance and Mobility Therapy Multiple patients said they missed seeing Lucia on a day she had off. Morgan W. | Balance and Mobility Therapy An outstanding compliment from a patient after her evaluation. Keith M. | Allied Rehabilitation Services Upon completing a supervisory visit on a complex patient, patient had nothing but good things to say about Keith. Keith has worked well with thinking "outside the box" with this patient in coming up with different treatment techniques to accommodate for the complexity of this patient's condition. Kim E. | Allied Rehabilitation Services Upon discharging a patient, patient could not say enough good things about Kim. She stated she was the most thourough therapist she has ever worked with and very pleasant. Martin U. | Carter Rehabilitation & Aquatic Center - Tecumseh For assisting with cleaning out the back storage room and making it a safe place to be, in case of emergency. Beckey D. | Carter Rehabilitation & Aquatic Center - Tecumseh For taking initiative and cleaning out the back storage room and making it a safe place to be, in case of emergency. Laura W. | Balance and Mobility Therapy A patient complimented her for her patience and a great treatment. Joe S. | Balance and Mobility Therapy One of Joe's BIG patients complimented his dedication and hard work. Enjoys seeing him each visit. Lucia M. | Balance and Mobility Therapy A patient scheduling said that Lucia was so nice and they enjoyed seeing her at the front desk on days treatment. Kayla P. | Balance and Mobility Therapy A wonderful compliment by a patient when Kayla was subbing in the pool. April J. | Fulton County Health Center - Outpatient Rehab A patient spoke very highly of April today. April was very professional and informative during her last treatment. It is wonderful to have April as part of our team. Amanda W. | Carter Rehabilitation & Aquatic Center - Adrian When I forgot my swimming clothes for a pool patient, Amanda brought me clothes to wear so that I could still get into the pool with my patient. She was a lifesaver. Diane K. | Carter Rehabilitation & Aquatic Center - Adrian I don't see many pool patients, however I do currently have one patient that is getting in the pool 1x/week. On the first visit with this patient, Diane helped me out by giving me good ideas to keep this patient engaged while still challenging him for his current skill level. She was very helpful to me in a situation that could have been much more difficult without her help. Kim E. | Allied Rehabilitation Services Patient was very pleased with services provided by Kim. Stated she had ber back in the 1990s for therapy and remembered her and was very glad she was her therapist again. Patient could not say enough good things about her. Malikah H. | Allied Rehabilitation Services Despite recommendation of MDs and nursing staff, a Pt left the hospital AMA and refused SNF services. He continued to decline at home over several days and refused medical attention, however, upon seeing the state the Pt was in, Malikah was able to help him understand the situation, his need for more help than could be provided in home health, and how rehab placement could benefit him. She then initiated the process by connecting the Pt to the necessary people at the agency. He was discharged after 2 weeks of rehab, looking and feeling like a new man, and said going was the best decision for him. Way to go Malikah! Amanda W. | Carter Rehabilitation & Aquatic Center - Adrian Amanda is always going above and beyond to make sure that we have food for our meetings. She took a second trip out in the pouring rain for us today. She is always more than willing to do what is asked. Always has a smile on her face while doing it! Patricia L. | Fulton County Health Center - Outpatient Rehab Submitted a suggestion with a co-worker that received a safety award from FCHC. Megan L. | Fulton County Health Center - Outpatient Rehab Received a safety award from FCHC for a suggestion she made. Christine K. | Balance and Mobility Therapy A patient recently raved to me about Christine how she has always been very helpful and smiling all the time. She is very thankful for her services and believes she is a great addition to our facility. Megan L. | Fulton County Health Center - Outpatient Rehab Megan co-presented a lunch and learn for FCHC and received positive comments from the participants such as GREAT SESSION!! Great job Megan & Becky! Thanks Megan & Becky! Very professional & educational Very Good! Becky M. | Fulton County Health Center - Outpatient Rehab Becky co-presented a lunch and learn for FCHC and received positive comments from the participants such as GREAT SESSION!! Great job Megan & Becky! Thanks Megan & Becky! Very professional & educational Very Good! Karen L. | Fulton County Health Center - Outpatient Rehab Karen has really been a great director during this transistion to the new building. She has been very helpful to each staff member while being very busy with the move. I feel Karen has good leadership skills and has really been a great asset to our department and she is really appreciated. Megan L. | Fulton County Health Center - Outpatient Rehab Megan is always very helpful in the clinic. She never hesitates to help the therapists make home programs and assist with treatments when things get busy. She always has a smile on her face and is a great memeber of the team. Judy O. | Carter Rehabilitation & Aquatic Center - Adrian Judy is always willing to help out whether in the clinic when it gets busy or covering shifts for co-workers. Your kind gestures don't go unnoticed! Cyndi T. | Allied Home Health Services Cyndi always treats our patients like family. Has recently proven her sharp nursing skills and persistance to lead a patient in the right direction for follow up, resulting in a new diagnosis and prevention from serious complications. Valencia N. | Allied Home Health Services Has been taking on more responsibilities in the office and shown to be a TEAM PLAYER! Linda M. | Allied Home Health Services Has been leaning new software system and has been tackling outstanding billing issues like a CHAMP! Angela S. | Allied Home Health Services Continues to go above and beyond to be sure our department runs smooth. Always dedicating extra time to complete the neccesary tasks. Jen G. | Allied Home Health Services She has taken great pride in training new staff and now learning herself in a new position. Toni G. | Carter Rehabilitation & Aquatic Center - Adrian Toni also strongly encouraged me to seek medical attention when I hadn't realized the seriousness of the situation I was in, which ultimately saved my life, my ability to walk, and other bodily functions most take for granted. Sofia A. | Carter Rehabilitation & Aquatic Center - Adrian Sofia strongly encouraged me to seek medical attention when I hadn't realized the seriousness of the situation I was in, which ultimately saved my life, and my ability to walk. Gino C. | Carter Rehabilitation & Aquatic Center - Adrian As a co-worker going through serious back problems requiring surgery, but unable to have the needed procedures due to circumstances beyond my control, Gino was helping me to try to manage what pain we could through therapy until the situations were resolved. Having fallen on my way out to the car one morning. I was relaying to him what had occurred, which prompted him to ask more detailed and insightful questions. The answers to these questions prompted him to consult with Sofia and Toni. The consensus was I needed medical attention as soon as possible. Not only did Gino go out of his way to drive me to the ER, he stayed with me until I was admitted to the hospital. It turns out that not only did I end up having emergency surgery on my back, I also unknowingly had an infection that was so severe I was almost septic. Gino's insistence in the face of my stubborness in trying to refuse going to the hospital literally saved my life. Laura W. | Balance and Mobility Therapy Laura is always so warm and friendly with patients. They feel so comfortable. Kayla P. | Balance and Mobility Therapy Patients have complimented her STRONG messages! Tammy L. | Balance and Mobility Therapy The Tuesday and Thursday water aerobics classes are a highlight to the members. Joe S. | Balance and Mobility Therapy His patients are so appreciative of his dedicated BIG work outs. BIG walking tierlessly. Lucia M. | Balance and Mobility Therapy A patient complimented her friendliness and helpfulness. Leah S. | Balance and Mobility Therapy For helpigng with computer functions for a project. Lanna W. | Allied Rehabilitation Services Pt had nothing but great things to say about Lanna and the care she is providing! Kayla P. | Balance and Mobility Therapy Layla has been implementing tracking sheets for our aides to help gather information about the treatment sessions as appropriate to assist with communication. She has also taken an active role in trading our many new aides to ensure they are performing exercises correctly with patients and teaching them how to appropriately guard with patients. Tammy T. | Balance and Mobility Therapy A patient commented on how friendly Tammy was when scheduling appointments and remembering to see how she was doing when she had cancelled appointments due to other family members being ill. She always followed up patient to check status for rescheduling appointments. Becky D. | Carter Rehabilitation & Aquatic Center - Tecumseh Becky goes the "extra mile" in many ways. She has devoted 15 years of service to CRC - Tecumeh and assumes the extra responsibility of training all new techs witha a very professional, positive, and encouraging demeanor. Diana R. | Carter Rehabilitation & Aquatic Center - Tecumseh Diana has helped us so many times coming in on her days off when we needed help. Her smile and kind nature is always a pleasure to work with. 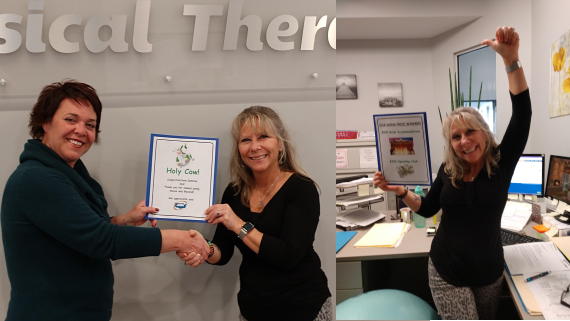 Ginger L. | Carter Rehabilitation & Aquatic Center - Tecumseh Her award winning reflex time when a fitness member had increased her pace on the treadmill to an unhealthy cadence. Ginger was working with a patient when she sprung into action to stop the treadmill. No one was injured thanks to her quick thinking. Karen S. | Allied Rehabilitation Services Karen has gone above and beyond by helping to cover at FCHC outpatient for a maternity leave getting to experience our move to a new location. She even agreed to stay on the whole 10 weeks versus only taking a 5 week turn. Keith M. | Allied Rehabilitation Services Keith has gone above and beyond by helping to cover at FCHC outpatient for a maternity leave getting to experience our move to a new location. He even agreed to stay on the whole 10 weeks versus only taking a 5 week turn. Lisa A. | Fulton County Health Center - Outpatient Rehab Lisa has gone above and beyond in trying to take care of a lymphedema patient at the Manor, working with nursing and materials management to ensure proper care and equipment ordering. On a particularly difficult case, Kate went above and beyond to provide support and educational material to the Pt's caregiver to help reduce stress and behavioral challenges associated with the Pt's diagnosis. The Pt's caregiver said that "every little thing Kate did lessened the burden," and allowed him to feel some relief that he had not previously felt. The caregiver said, "I can never thank her enough for the way she helped me and my wife." Pt reported that Tracy went "above the call of duty" to really listen to what the Pt was saying and addressed all concerns related to her ability to perform self care. The Pt stated that Tracy took extra time during each session to show her different types of AE or different techniques that could be used to accomplish daily tasks, and gave her suggestions for how the Pt could better participate in an upcoming trip she would be taking. The Pt said that she will use the same agency in the future in order to have Tracy, again! Pt contacted the office for the sole purpose of complimenting us on the care Kim provided to her. Pt said that it was obvious how much Kim cares about her job and her Pts. and that Kim went above and beyond to help the Pt get back to her previous function. Recent patient stated how pleased she was with Kim's services. She couldn't go on about big Kim's heart is and how she is very passionate about her job and helping people. Patient stated that she became very upset at the end of her therapy session that she could not go up her very steep front step. Kim took the time to take the patient back outside and around to her back door and go up and down these steps independently to show her that the step is just too steep for her and this is her best method of getting in and out of the home. This calmed the patient greatly. Nina A. | Carter Rehabilitation & Aquatic Center - Tecumseh Worked on her day off. Always positive and pleasant with patient care regardless of work help we have for the day. Megan L. | Fulton County Health Center - Outpatient Rehab Even though Megan was recently back from medical leave and still under lifting restrictions she worked very hard to help with our move from the Elm Street location to the FCHC campus. When other people decided that some things are not "in their job description" Megan is usually the one that picks up the slack. Karen L. | Fulton County Health Center - Outpatient Rehab Karen cancelled her vacation to spend her time working to make sure that our move from the Elm Street location to the FCHC campus would get done on time. She put a lot of thought into how to configure a lot of necessary equipment and staff into a much smaller area. The result is a brand new therapy department that was ready for our grand opening on Tuesday September 5th. She went above and beyond her duties as Director to coordinate this move in a very short time. Shelby V. | Fulton County Health Center - Manor Shelby was very helpful when I first started my employment with APRN. Any time I had a question, she always made time to answer and provide assistance. She has gone out of her way to make me feel welcome and I really appreciate all that she does, not only for myself and our department, but for our patients as well. Megan L. | Fulton County Health Center - Outpatient Rehab Megan has gone above and beyond to move OT therapy equipment and belongings to our new facility. Thank you Megan so much for all your help. Keith M. | Allied Rehabilitation Services Patient and wife were very pleased with the care provided by Keith. Patient went from barely standing to being able to ambulate in his home. Wife stated that if they ever need home care services again, they will be requesting Keith. Ginger L. | Carter Rehabilitation & Aquatic Center - Tecumseh Ginger sure knows how to step up and help with all facets of the facility when short staffed. Thank you for your hidden super powers! Sarah M. | Carter Rehabilitation & Aquatic Center - Tecumseh Sarah sure knows how to step up and help with all facets of the facility when short staffed. Thank you for your super powers! Nina A. | Carter Rehabilitation & Aquatic Center - Tecumseh Krista sure knows how to step up and help with all the facets of the facility when short staffed. Thank you for your hidden super powers! Krista K. | Carter Rehabilitation & Aquatic Center - Tecumseh Krista sure knows how to step up and help with all facets of the facility when short staffed. Thank you for your super powers! Andy K. | Fulton County Health Center - Outpatient Rehab Andy has been very helpful with my student and willing to help with the observation students. His help has been very much appreciated. Matt T. | Fulton County Health Center - Outpatient Rehab Matt has been extremely helpful with my student it has been very much appreciated. Kim E. | Allied Rehabilitation Services Going above and beyond to make sure that patient's care is in place after completion of home care. Kim E. | Allied Rehabilitation Services Several patients have recently complimented Kim on her care and compassion over the past week. One patient even stated that Kim was the most compassionate healthcare worker she has ever met and really enjoyed her services. Keith M. | Allied Rehabilitation Services Patient was very pleased with the care provided by Keith and how he was able to answer a lot of patient's questions and concerns. Norm W. | Carter Rehabilitation & Aquatic Center - Tecumseh Norm took pictures at the run on a Saturday and is always willing to help. Carley L. | Carter Rehabilitation & Aquatic Center - Tecumseh Carley, helped with the run as a timer on a Saturday, always willing and with a smile, this is a true sign of community service. Jessica S. | Carter Rehabilitation & Aquatic Center - Tecumseh Jessica was new this year and came early to help with the run on a Saturday, clocked out, this is truly community service. Zach P. | Carter Rehabilitation & Aquatic Center - Adrian Zach helped with being a lead biker and traffic control at run, on a Saturday, clocked out, this is truly a sign of community service. Kyria W. | Carter Rehabilitation & Aquatic Center - Adrian Kyria stepped up to the plate for the run, tabulation and other activities and showed composure in a stressful situation, clocked out of time clock, this is truly a sign of community service. Diane K. | Carter Rehabilitation & Aquatic Center - Adrian Diane helped with registration with Molly for the run and with a smile, clocked out, this is truly a sign of community service. Molly T-S. | Carter Rehabilitation & Aquatic Center - Adrian Molly helped with the Kelly Carter Run, off the clock, in many ways and with a cheerful spirit, this is truly a sign of community service. Nina A. | Carter Rehabilitation & Aquatic Center - Tecumseh Nina helped to get the food ready for the runners early on a Saturday morning, off of the clock, volunteerism is truly a sign of community service. Sarah Y. | Carter Rehabilitation & Aquatic Center - Adrian Sarah volunteered to help with the run this year and was always gracious and willing, volunteerism is truly a sign of community service. Annette K. | Carter Rehabilitation & Aquatic Center - Adrian Annette shared her fruit with an OT patient in need. She is always going over and beyond for patients and co workers. Keith M. | Allied Rehabilitation Services Patients cannot say enough about the care that Keith provides to his patients and their families. Many patients have stated they will continue to come back to Allied for future needs specifically because of the care he provides and the progress they make when working with him. Repeatedly, patients/caregivers have commented on how well he explains things in ways they can understand, makes it applicable to daily life, and is understanding of just how much to push them. It should also be noted that Keith has been great proponent of other services, encouraging patients to allow other disciplines to come into the home; they say if not for Keith, they wouldn't have known how beneficial the other therapies were! Kim E.| Allied Rehabilitation Services Kim took extra time out of her day to contact outpatient therapy clinics and ask questions regarding options for assistance for car transfers, transportation, and equipment availability, and provided the information to the Pt and his caregiver. This is something the Pt an and family could have easily done on their own, but Kim took it upon herself to gather the info for them in an effort to help them feel more comfortable with the idea of transitioning to outpatient therapy. Lucia M. | Balance and Mobility Therapy For being so kind in welcoming the patients. A patient complimented that she always greeted him so kindly and knew is name. Leah S. | Balance and Mobility Therapy She helps out with the administrative task of updating e-mail list when she has patient cancellations in the morning. Lyn D. | Balance and Mobility Therapy She revised theexercise chart storage system to make it much quicker and easier to pull charts. Cherie' L. | Carter Rehabilitation & Aquatic Center - Tecumseh For fixing a toilet that keeps running with a paperclip after a plumber came on 2 different occasions to "fix" it. The silence is beautiful. Thank you. Derrick G. | APRN Corporate Most of us know that Derrick is a rock star when it comes to techie matters. He is also terrific at documentation and at keeping a handle on ever-changing matters throughout our whole organization. Whatever tech fires may be burning he is always pleasant and helpful wth whatever you need. He is a catch! Nina A. | Carter Rehabilitation & Aquatic Center - Tecumseh Nina is a gem. Listening to how she interacts with patients, especilly those experiencing pain, is exceptional personal care. Leah S. | Balance and Mobility Therapy A patient raved to me how she was glad Leah worked with her. She was able to explain everthing to her and took the time to do so. She was very pleased with this. Karen S. | Allied Home Health Services Pt couldn't say enough good things about Karen and Malikah (and all of us :) ); she said they helped her regain her strength and endurance and taught her many useful tips and strategies from completing ADL, IADL, and functional ambulation inside and outside of her home. She was able to go upstairs to access her bed/bathroom, able to go out on an hour long grocery shopping trip, and had more endurance cooking for her large family. She said she will miss having the girls come out. Malikah H. | Allied Home Health Services Pt couldn't say enough good things about Karen and Malikah (and all of us :) ); she said they helped her regain her strength and endurance and taught her many useful tips and strategies from completing ADL, IADL, and functional ambulation inside and outside of her home. She was able to go upstairs to access her bed/bathroom, able to go out on an hour long grocery shopping trip, and had more endurance cooking for her large family. She said she will miss having the girls come out. Judy O. | Carter Rehabilitation & Aquatic Center - Adrian Judy went above and beyond by leaving the front desk and coming out to the gym to walk Pts through exercises because one of our techs called in sick. Malikah H. | Allied Rehabilitation Services When a maternity leave, an illness, and a resignation all occurred at the same time, Malikah offered to take on additional work across a large chunk of our coverage area (Oregon to Swanton) to make sure patients were seen. Malikah is always willing to go above and beyond to make sure visits are completed, often working on weekends or picking up late visits. She is a major reason the ARS OT department is successful! Aaron D.| Carter Rehabilitation & Aquatic Center - Adrian I would like to give Aaron a big Holy Cow! award because everytime I ask for help here at DLC, he is always willing to find me a helper. Thank you! Kristy R. | Fulton County Health Center - Respiratory Kristy was coming into work on a Wednesday morning and saw a woman laying in a yard across the street from FCHC. The patient was holding her knee and appeared to be in pain. Kristy parked her car and went out to the patient to see if she needed help. The patient had been on her way to an appointment with her orthopedic doctor at the medical office building, but had fallen, hurt her knee and was unable to get up. Kristy went and got help right away. With the help of medical office employees, they were able to get the patient into a wheelchair and transport her safely across State Route 108 to her physician's office. Jen G. | Allied Home Health Services Jen is a GREAT team player! She does her best to help out others anytime we ask by covering others work duing vacations. Malikah H. | Allied Home Health Services Karen and Malikah worked very hard with Mrs. P. She went from not being able to get out of her recliner to dressing herself, completing shower and toilet transfers, doing dishes, and going up and down stairs! They did such a great job! Karen S. | Allied Home Health Services Karen and Malikah worked very hard with Mrs. P. She went from not being able to get out of her recliner to dressing herself, completing shower and toilet transfers, doing dishes, and going up and down stairs! They did such a great job! Malikah H. | Allied Home Health Services Mr. and Mrs. A couldn't say enough great things about Malikah and her services. They said they got along great he made many functional improvements to regain his independence. Tanya T. | Allied Home Health Services I really appreciate everything Tanya has done for me and for the company. She wears many hats around here and although I know she gets overwhelmed, she manages to keep things together. She is very good at her jobs, Administrator, Nurse, Scheduler, and keeping up on authorizations along with organizing birthday lunches, outings, and other special recognitions for her staff. Angi S. | Allied Home Health Services I want to thank Angi for all her help as we adjust to our new software and I adjust to doing Oasis full time, she has been very patient with me and I really appreciate everything she has done for me. Tina S.| Allied Home Health Services I was told by a patient what a great help she was, they were sad to lose her when he was discharged. Ashley G. | Allied Home Health Services I was told by a patient, "loved her, she was a great help, she is a great nurse". Bonnie Y. | Carter Rehabilitation & Aquatic Center - Adrian (DLC) To Bonnie for stepping up in helping with scheduling when Teresa is on vacation, and closing out charts and scanning them to the computer when she has down time. Thank you! Kim E. | Allied Rehabilitation Services Thanks to Kim's efforts, ARS was able to sign a new contract with a new nursing agency in town. Without her information, we would not have been able to initiate this new business connection. Thank you, Kim! Kayla P. | Balance and Mobility Therapy Kayla is always willing to help out when necessary. Today she offered to come in at 7:15 to help with an overbooking and then clock out and run errands until her actual shift starts at 10:15. Always a team player whenever needed. Glady N. | Carter Rehabilitation & Aquatic Center - Adrian (DLC) Glady is a person of very clear insight of things. This week she looked at my walker as she passed by me as I was doing my exercises. She said, "I will help you keep these wires from reaching out so much". She went and got a special wire to attach the other wires to the side of my walker. Then she put a special plastic tip over the wire and tightened it down. I was so grateful that she fixed these wires because I had been having trouble with them getting caught in things for several days and I had not mentioned this to her. SHE SAW THE TROUBLE AND CORRECTED IT!! Glady also has special hands that sense what is causing pain in my knees. I tell her I have pain around my knees and she feels around it and says, "Is this hurting right here?" and I said, "It sure does!" She then tells me what is the matter and gives me an exercise for it. This is a great help for me!!! Glady is a precious helper who really works sincerely to help our sisters. SHE IS TALENTED AND HOLY PERSON!!!!! Teresa D. | Carter Rehabilitation & Aquatic Center - Adrian (DLC) Teresa is a well trained activity helper who really pays attention to the needs of the sisters who come to do exercises in the Rehab Room. There are times that I feel disappointed that I have pain as I do my exercises and she will come to me and say something happy or adjust something I need and she has figured it out without my having to say anything! She really works beyond the requirements of being a Rehab Worker! Her work unfolds with kindness, love and excellent sightof needs our sisters have!!! SHE IS A HOLY PERSON!!!!!! Sylvia W. | Carter Rehabilitation & Aquatic Center - Tecumseh Sylvia is always professional, even with multiple interruptions for various reasons. She is the back bone of the front desk and is always available, willing and gracious to help a co-worker in need. Matt T. | Fulton County Health Center - Inpatient Rehab Matt went above and beyond his normal job duties by volunteering to help with our WHS sports physicals. He performed thorough musculoskeletal screens to ensure the athletes are safe to compete in sports this comming year. He and Tony made it very fun for the kids as well! Thanks Matt! Tony S. | Fulton County Health Center - Manor Tony went above and beyond his normal job responsibilities by volunteering to assist with WHS sports physicals. He performed thorough musculoskeletal screens for athletes to ensure they are safe to participate in sports next year. Thanks Tony! Suzie T. | Fulton County Health Center - Outpatient Rehab Suzie showed her investment in the community by volunteering to help with our WHS sports physicals, as she has for many years. She stayed after clinic hours to help register the athletes and collect money for the fundraiser. Thanks Suzie for your help! Becky M. | Fulton County Health Center - Outpatient Rehab Becky went above and beyond her normal job duties by volunteering to help out with our annual WHS sports physicals. She did a great job performing musculoskeletal screens for athletes. Thanks Becky! Anna B. | Carter Rehabilitation & Aquatic Center - Adrian I would like to nominate Anna B. She is on top of the paperwork to receive authorizations for PT visits and takes the extra steps to answer your questions right away. She is always willing to stop everything she is doing to answer your questions. I appreciate her help and her willingness to answer the questions quickly. Megan L. | Fulton County Health Center - Outpatient Rehab Megan wears many hats in the outpatient facility. She has been extra helpful with the clerical duties in addition to working with fitness members. She is always very helpful with physically difficult patients. It is a pleasure to work with Megan and am glad she is so helpful. April J. | Fulton County Health Center - Outpatient Rehab April had a patient that needed extra care and monitoring duing the treatment. I felt that she was very skillful, professional and attentive to the patient. I am very proud of her performance, and am glad she is part of the team. Laura W. | Balance and Mobility Therapy Laura used 4 of her lunch hours this week to train on the C-mill so we can start to use it in the facility. Dan S. | Balance and Mobility Therapy Dan used 3 of his lunch hours this week to train on the C-mill so we can start to use it in the facility. Kayla P. | Balance and Mobility Therapy Kayla used 4 of her lunch hours this week to train on the C-mill so we can start to use it in the facility. Joe S. | Balance and Mobility Therapy Joe took his lunch hours to train the BAM staff on the C-mill to implement quicker use of it in the facility. Ben C. | Carter Rehabilitation & Aquatic Center - Adrian Ben goes above and beyond with helping in the clinic. Today he plunged a toilet when no one else wanted to volunteer. He is always helpful, and willing to help! Thank you Ben! Sizoe T. | Fulton County Health Center - Outpatient Rehab She assisted a Patient in finding the Surgeon that is doing her operation. Kaylee M. | Carter Rehabilitation & Aquatic Center - Tecumseh Kaylee stopped what she was doing on the other end of the PT clinic and helped Kadri and me when my Pt lost his balance and nearly fell while getting on an exercise amchine. Without her help, my Pt would have fallen and potentially injured himself. Kadri U. | Carter Rehabilitation & Aquatic Center - Tecumseh Kadri dropped what he was doing and ran over to help me catch a Pt who was falling. Without his help, I would not have been able to prevent my Pt from falling and potentially injuring himself due to the exercise machine the Pt was on. Jenna M. | Carter Rehabilitation & Aquatic Center - Adrian I had a patient tell me that Jenna made it easy to come to therapy because she has such a great time in O.T. with us. Laura W. | Balance and Mobility Therapy A patient gave her a tremendous compliment and thank you for treating her "and making her work hard". Kayla P. | Balance and Mobility Therapy Kayla is always willing to help out with the extra office work when she has a cancellation on her schedule. Molly S. | Carter Rehabilitation & Aquatic Center - Adrian Molly went out of her way to help with a new project board for OT that will assist in the individuals with visual deficits or neglect. Brooke S. | Carter Rehabilitation & Aquatic Center - Adrian Brooke is a new Aide hire and is already going over and beyond expected. Laura B. | APRN Corporate Laura has always been a very smart, detective. When there is somthing that neesd to be solved regarding dollars and cents, she is my go to person. She has always willingly helped, but this time she went over and above! Lucia M. | Balance and Mobility Therapy Helping with a very difficult situation!! Lucia M. | Balance and Mobility Therapy Lucia went above and beyond by cutting her lunch short to cover the front desk when it was needed. Derrick G. | APRN Corporate Derrick drove out to Wauseon on short notice to help with our time clock/internet which was not sending time card information to Paycor so payroll could be completed. Suzie T. | Fulton County Health Center - Outpatient Rehab Suzie has been very flexible over the last few months due to turnover of multiple staff at the front desk, woking with new hires to orient them and flexing her schedule as needed. Amanda W. | Carter Rehabilitation & Aquatic Center - Adrian We needed something typed for a doctor promptly, faxed to Amanda and she typed it. She is always willing to help the Tecumseh faility when typing. Dan S. | Balance and Mobility Therapy Being BAM's Mr. Technical expert!! Tammy T. | Balance and Mobility Therapy Going above and beyond in cleaning the facility! Teresa S. | APRN CorporateTeresa went over and above to help me collect data for a Fulton required report. Her willingness to help shows she is an example of a team player! Thank you!! Joe S. | Balance and Mobility Therapy Joe is always more than willing to help accommodate schedule changes when staff call off. He will also offer assistance to other staff members when he has a cancellation to assist with any double booking another staff member may have. Tammy L. | Balance and Mobility Therapy Tammy came in on her day off to help with the afternoon pool schedule to ensure adequate coverage for effective patient management. Gino C. | Carter Rehabilitation & Aquatic Center - Adrian Gino showed tremendous judgment in referring a patient back to the doctor / hospital for CVA signs. She ended up having a rare type of CVA, but they were able to treat it in time because of Gino's proactive call. He literally saved a patients life!! Tony S. | Fulton County Health Center - Manor Tony received a compliment about a presentation he provided for Fulton County employees that they were very pleased with his energy, knowledge, and delivery. He also received great ratings from all attendees. Kristin K. | Fulton County Health Center - Outpatient Rehab Kristin received a compliment from an area orthopedic surgeon that she was the best ATC we have ever had at Wauseon High School. Bonnie Y. | Carter Rehabilitation & Aquatic Center - Adrian (DLC) Bonne stepped up and treated most of my patients and managed the department when I was sick for 2 days. Tammy M. | Cameron Memorial Community Hospital - Respiratory Tammy is awesome with the patients, and a wonderful person to work with! She is always willing to help, and goes above and beyond her duties. Erin R. | Allied Home Health Services Patient had nothing but good things to say about Erin!! Lisa A. | Fulton County Health Center - Outpatient Rehab Lisa always handles every situation in the best manner. She always makes sure that patient's get the best care and treatment that they need. She is always willing to assist and help others when in need. Teresa S. | APRN Corporation Teresa went over and above to help me with a very important report for FCHC and was an awesome team member during all of it. THANK YOU Teresa!! April J. | Fulton County Health Center - Outpatient RehabApril is always willing to assist her co-workers and step in to see patients even if they were not originally on her schedule or they arrive at the wrong time. She then provides them with a great treatment. Kim E. | Allied Rehabilitation Services Patient had nothing but good things to say about Kim. Patient is very thankful for her catching her open wound on her back. She stated, "if I could give her a gold star, I would." Several other patients also have complimented Kim on her services over the past several days when going out for final visits. Beth G. | Fulton County Health Center - Manor On Sunday, March 19th, the PRN COTA scheduled to work called off ill. Beth G., OTR was willing to assist and came in to treat all of the Manor patients scheduled for that day! Thanks, Beth! Amanda W. | Carter Rehabilitation & Aquatic Center - Adrian Amanda quickly typed two documents at the end of the day becuase of patient having early doctor appointments the next day, even though it caused her to get behind on her own closing responsibilities. It was very helpful and greatly appreciated so that the doctors had appropriate infomation about the patients before they arrived to their appointments on the next day. Valencia N.| Allied Home Health Services While I was on medical leave, Valencia not only did her office work but my daily office work as well. I am thankful for her because I could have returned to work to a mountain stack of projects to do. She made my transition back to work go smoothly. Tony S. | Fulton County Health Center - Manor Tony who usually works at the Manor had to cover multiple outpatient evals for us on Monday due to a call off. He remained positive throughout the afternoon even when we were having EMR problems and he was not able to get into any of the records to do his documentation. Joanne G. | Fulton County Health Center - Manor Joanne has been trying to hold things together during the vacancy in our rehab aide position making sure all our billing is done correctly, files created, filing done, chart audits completed, etc. in addition to all of her other duties. Her hard work is greatly appreciated! Lisa A. | Fulton County Health Center - Outpatient Rehab Lisa takes primary responisbility for our pool and spa and we were notified of some new issues with our spa on Saturday by the weekend fitness trainer. Knowing that the Health Department was coming in on Monday to re-check it Lisa came in on Sunday after she returned from out of town to deal with the chemicals so we would pass the health department check on Monday. Judy O. | Carter Rehabilitation & Aquatic Center - Adrian Judy made sure that paperwork for a recent UR meeting was taken care of when I was off without being asked to follow through with it. I appreciate the attention and reliability without being asked! Anna B. | Carter Rehabilitation & Aquatic Center - Adrian Anna helped me out by making sure food was ordered and taken care of for our UR meeting that was on a day that I was off. I appreciate the help and reliability when I'm not there to make sure things are taken care of properly. Karen L. | Fulton County Health Center - Outpatient Rehab We would like to recognize Karen for her outstanding achievement in her work with the Council on Academic Accreditation in Audiology and Speech-Language Pathology (CAA) and her second term with this prestigious organization. Here is what the CAA had to say about Karen, "You have been selected because of your prior experience in accreditation activities, the special expertise that you bring to this process, and positive performance feedback that you have received from your site visitor peers and site visited programs." Karen is an excellent clinician and leader at APRN; we are honored to have her on our team. Great job Karen!! Becky M. | Fulton County Health Center - Outpatient Rehab Duing a staff member absence Becky is very helpful, going above and beyond, restocking linen in rooms, measuring temperatures, and cleaning rooms. It makes everyone's day easier. Sylvia W. | Carter Rehabilitation & Aquatic Center - Tecumseh Sylvia has been going above and beyond to cover for unexpected staffing needs throughout the last few months. Her dedication and generosity of time has kept the office going and done with a great attitude and smile! Anna B. | Carter Rehabilitation & Aquatic Center - Adrian Anna was extremely helpful to an office member at another location, and walked her through a detailed process quickly and efficiently (over the phone). She was very patient and professional and the report was delivered in a timely matter. Thank you Anna! Kim E. | Allied Rehabilitation Services A patient had nothing but good things to say about Kim and is very pleased with the service she is receiving. Keith M. | Allied Rehabilitation Services Keith has greatly improved his documentation over the past several months. Keep it up!! Bonnie Y. | Carter Rehabilitation & Aquatic Center - Adrian (DLC) Bonnie is a team player. She figured out how to scan the documentation into the computer then scanned them which is a huge help to Teresa. Jenna M. | Carter Rehabilitation & Aquatic Center - Adrian While I was at the front desk super busy Jenna not only answered the phone, but resolved a scheduling issue for a patient. Her assistance was greatly appreciated. Thank you Jenna! April J. | Fulton County Health Center - Outpatient Rehab April was very helpful with assisting my student when I was unable to. April is an excellent team member and is always willing to go the extra mile to help. Lisa A. | Fulton County Health Center - Outpatient RehabLisa had a very physically and mentally challenging patient. She dealt with a very stressful situation calmly and professionally. Kyria W. | Carter Rehabilitation & Aquatic Center - Adrian Kyria had a different approach to a month end report that was much easier and if it works will nominate her again next month. Glady N. | Carter Rehabilitation & Aquatic Center - Adrian (DLC) Glady not only runs the PT department, she educates, sees patients in the clinic and takes care of the Sister's needs at DLC. She does all this with grace and a smile. Bonnie Y. | Carter Rehabilitation & Aquatic Center - Adrian (DLC) Bonnie sew a cover to pad a pulley handle to make it comfortable for the sisters to use. Thank you Bonnie. April J. | Fulton County Health Center - Outpatient Rehab A patient commented on what great treatment April provided to her during her total knee rehab. Great job April, glad to have her as part of our team. Tammy T. | Balance and Mobility Therapy Tammy came in on her day off between appointments to type reports that needed to get out for insurance authorizations. Anna B. | Carter Rehabilitation & Aquatic Center - Adrian When Anna saw that a co-worker was struggling to finish report typing, Anna offered to stop what she was doing to assist her co-worker complete paperwork within a small timeframe. It was such a great help. Amanda W. | Carter Rehabilitation & Aquatic Center - Adrian Amanda was amazing in quickly finishig the typing of paperwork in order to assist a smooth transition of OT's from clinic to clinic. It was not an easy day, but she completed paperwork with no complaints. Clayton B. | Carter Rehabilitation & Aquatic Center - Adrian Clayton went above and beyond to clean a bathroom disaster today. Teresa D. | Carter Rehabilitation & Aquatic Center - Adrian (DLC) Since the beginning of this year, Teresa has been functioning as a Therapy Tech, Wellness Assistant, and Office Coordinator of the Carter DLC. Despite these multi-functioning job, she managed to smile and be "cool" to the staff and the sisters. Thanks a bunch Teresa! Andy K. | Fulton County Health Center - Outpatient Rehab Andy was very helpful entering measurements in the computer for me while I assessed the patient. Andy has been very helpful and a very good asset to our team. Tammy L. | Balance and Mobility Therapy Tammy worked over to help her team out by performing a massage on a patient that got her appointment wrong. Kayla P. | Balance and Mobility Therapy A patient that is in OT and PT just raved about Kayla after her PT session. The patient was so impressed that Kayla truly pays attention to her concerns. The patient also liked that Kayla maintains a hands on approach and takes the initiative to modify exercises if something isn't working how it is intended to work. Kristin K. | Fulton County Health Center - Outpatient Rehab A client in wellness spoke very highly on how well Kristin cared for his Grandson. He was very impressed on her professionalism and skills as a athletic trainer. He was very pleased how she helped speed up his recovery and got him back into the game. It makes me proud to here these stories about our staff in the community. Thank you Kristin for doing a wonderful job. Beth G. | Fulton County Health Center - Outpatient Rehab Beth has been very helful transferring a very difficult patient and helping in the restroom. She helped without reservation and it was really appreciated. Megan L. | Fulton County Health Center - Outpatient Rehab Megan is always very helpful to each staff member when ever anyone needs an extra hand. She goes above and beyond and is always very pleasant. She has really been helpful with the front desk during vacations. I feel she is a really great team member. Amy F. | Allied Home Health Services Amy went the extra mile to clean out a home care patients trash can after noticing it had fruit flies in it. Amy F. | Allied Home Health Services Amy is a great team player and has had helped orient 2 new nurses in home care! She genuinely offered her expertise and took the extra time to do so. Angela S. | Allied Home Health Services Angi will always help out a co-worker in need. She has done a phenomenal job this week to assist in paperwork/orders, phone calls and computer issues for the staff in home care without being asked! Valencia N. | Allied Home Health Services Valencia's computer skills in Excel and Word were greatly appreciated this week as she able to assist and teach a co-worker. Lucia M. | Balance and Mobility Therapy Lucia took the initiative to clean the women's bathroom during an emergency situation! She did a very good job & was able to keep things running smoothly! Way to go, Lucia! Amy F. | Allied Home Health Services Amy's patients always have great things to say about her! She is very personable, caring, and helpful no matter what, and they look forward to her next visit! Rebecca M. | Fulton County Health Center - Outpatient Rehab Becky is always willing to lend a hand for patient care when she has down time. Lisa A. | Fulton County Health Center - Outpatient Rehab Lisa offered to treat a patient for me when I became very backed up with paperwork despite having her own work to catch up on. Carida S. | Fulton County Health Center - Outpatient Rehab Carida was very helpful to come in to close the office when Suzie needed to go home. Lisa A. | Fulton County Health Center - Outpatient Rehab Lisa is always willing and very helpful, to open the Rehab when she is needed to. Jessye H. | Fulton County Health Center - Outpatient Rehab As another example of Jessye's willingness to help out wherever needed she even covered the front desk area when the receptionist needed to take a lunch break. Becky M. | Fulton County Health Center - Outpatient Rehab Becky is very diligent about educating patient's regarding their home exercise program. She always remembers to provide the patient with a written hand out, even if she has to place it in the patient's chart for the therapist to provide the patient with at their next vist. Melissa M. | Balance and Mobility Therapy Melissa continues to educate herself in neuro to make BAM the best place to get rehab. Dan S. | Balance and Mobility Therapy A patient drove all the way to their appointment from Delta with a mouse in the car. The patient was very upset and asked for help! Dan grabbed the broom and chased the mouse out of her car three times. It keeps jumping back in!!! Dan successfully helped the patient get rid of her unwanted passenger! This was so above and beyond!!! Tony S. | Fulton County Health Center - Manor Tony very graciously agreed to work for me so I could be home with my kids. Both my children and I very much appreciated it. Clayton B. | Carter Rehabilitation & Aquatic Center - Adrian Bring a tech, Clayton has been called upon for some very crappy jobs! Unclogging the toilet and cleaning up vomit. THAT is going beyond his job expectations. Clayton is always willing to help wherever needed, even in the billing dept. Pt's enjoy woking with Clayton. He will be a terrific PTA. Zach P. | Carter Rehabilitation & Aquatic Center - Adrian Always so helpful to patients and co-workers. Had a patient tell myself how nice and wonderful he was to work with.